Perhaps the biggest hit of indie cinema so far this year, German-Israeli production “The Cakemaker” opened in local theaters Thursday. The film was shown in the noncompetitive World Cinemascape section of the Jeonju International Film Festival early this month, where the movie’s main actress Sarah Adler also served on the jury. The Korea Herald sat down with writer and director Ofir Raul Grazier ahead of a screening on May 6. The idea quickly sparked Grazier’s imagination, as he wrote out a first draft of the screenplay in five days that would eventually take him eight years to screen as his first feature. “I wanted to see this movie. I wanted to make it so that I could watch it,” he emphasized. 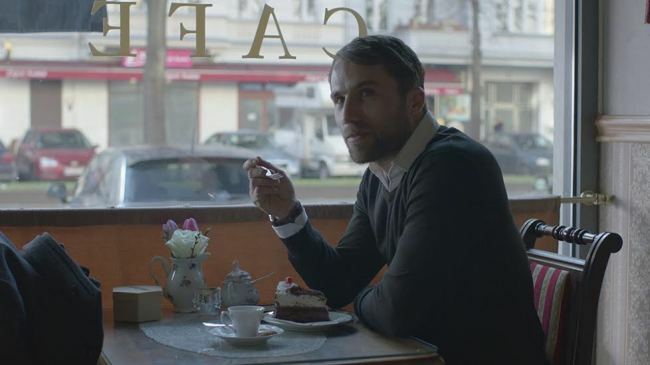 “The Cakemaker” is a cross-cultural journey that begins in Berlin with an affair between a married Israeli man and young German baker. When the man dies suddenly, the baker -- Thomas, played by Tim Kalkhof -- goes to Jerusalem to see for himself the life his lover left behind. In doing so, he finds his way into the man’s family, working at the coffeehouse run by his widow Anat. The film is gorgeously shot, with the same kind of meticulous care Thomas is shown giving to the cakes and cookies he produces, as the director’s passion for the subjects shines through. “I wanted to shoot food, and I wanted to shoot Jerusalem and to shoot Berlin -- the two cities that I love the most,” said Grazier, who has lived between the two cities throughout his life. He explained it was the images in his mind of a woman surrounded by thousands of cookies, or a melancholy German man in a Jerusalem food market with all its colors that motivated him. Historical difficulties between Germans and Jews are not lost in “The Cakemaker,” but even tweaked and played with. Ill-fated lover Oren is a Jew who works for a train company in Germany and, after getting a job at the coffeehouse, the German baker is scolded and barred from using the oven – with the terms “kosher” and “Shabbat” coming up often. Inescapable for its Jerusalem setting, conflict between Palestine and Israel is also a backdrop to the film, but Grazier seeks to go beyond the historical and political. “This is a very personal story about loss and love and feelings of people. And it has a very complicated political context -- religion, nationality and history -- and the reason I did that is because I want to say that the political context has to be pushed aside and the personal will come,” Grazier said at the Jeonju film fest. As Thomas settles into a new life in Jerusalem near his former lover’s widow, he seems just as curious as the audience about what will happen next, pushed on by his emotion and without calculation. How can he grieve for a secret lover? And how does his perspective change as he is accepted into a culture and family that could be hurt by knowing his truth? The success of the film emerges from the way it weaves together the mournful emotions of the baker, the widowed wife, the couple’s young son and the connections between them, as they break through barriers they may have been unaware of. For the director’s sophomore effort, nothing has been set yet, but he’s begun writing for three projects he describes as vastly different genres, and is seeking other materials to develop.